Joined by Captain Morgan, Rufus, Terrie (the world renowned motorcyclist) and Dean, we took a break from cleaning and troubleshooting to enjoy one last meal of Shrimp and Grits at out favorite place to get them The Chelsea in New Bern. 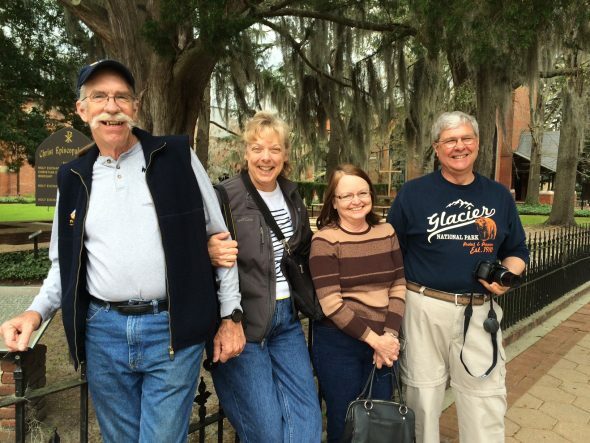 Thanks to Rufus for this great shot in front of the Episcopal Church in downtown New Bern. If you get a chance, you should visit New Bern again. They built a very nice new museum right on the waterfront that links the downtown area with Tryon Palace. Lots of beautiful things to see down there and of course DELICIOUS food!